It was a day this beautiful--clear and sunny in Tuscaloosa--on this date in 1986. I drove from That Other City where I'd been living, followed by Mr. Category 3 in his car. Both of our cars were full of my possessions because I was moving back to my favorite town--into the brownstone with the giant flying palmetto bugs where I was still living when I met Tom, so there were lots of good things in store for me, though it didn't feel like it that day. We got out of our cars behind ten Hoor Hall, where I was scheduled to teach, and Category 3 said, "Were you listening to the news?" I hadn't been, and he told me about the Challenger breaking up after liftoff. I met with my students long enough to cancel classes that day, then he and I went to a barbecue place on the Strip--its name will come back to me in the middle of the night--because they had TVs there. That's the day I fell in love with ABC's Peter Jennings because he was so calming as he delivered information as it came in. It was an awful day. 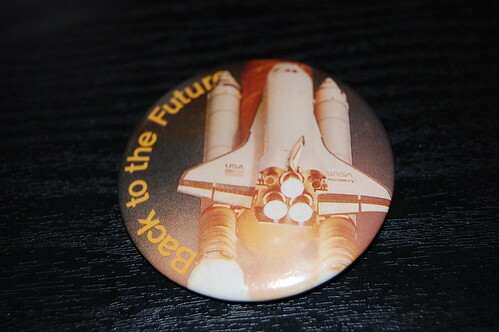 I would eventually meet people who would tell me first-hand what it was like to be employed on January 28, 1986, by companies that helped build the shuttles, the SRBs, and the external fuel tank. I was working on a NASA team at Redstone Arsenal on September 29, 1988, when Discovery took the U.S. back into space. It was amazing to watch the launch with people who were so invested in its success.